Why does my barcode fail? Where do I obtain a library barcode? Where is the barcode located? How do I enter the barcode number? Do I have access to all electronic databases? Make sure you are entering the correct credentials...last name and the 14 digit number on your id card that starts with 25022. If you are a student at the University of Maine, the barcoded card you received at registration is not valid until it is activated at the library. Go to the campus library and staff will link the barcode to your patron record. NOTE: Library staff cannot link your barcode via telephone. Students from other UMS campuses must obtain a barcoded library card at the campus circulation desk. The patron authentication database has not yet been updated. If you know that your barcode has been activated, or you have received it from a UMS library circulation desk, but you are still denied access to databases, the reason you are denied access is that the patron authentication database has not yet been updated. All of the ports the library has licensed to access the database are in use. Try again later. Access to the database you selected is restricted. Your campus library may not be licensed to use the database you selected. 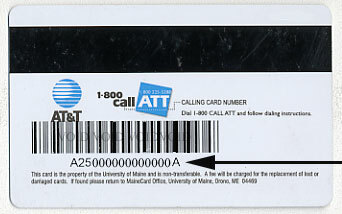 Newer Maine cards may begin or end with the letter "A" on the barcode. If so, please exclude the letter when manually typing your barcode at a login to gain access to an online index or database. Go to your campus library circulation desk to obtain a barcode library card or activate the barcoded library card you received at registration. Enter all fourteen digits of the barcode number without spaces. If your barcode begins or ends with the letter "A", please exclude it when manually typing your barcode at a login to gain access to an online index or database. No. The electronic databases are licensed by the UMS Libraries or individual campus libraries. Access is limited to students, faculty, and staff of participating libraries.